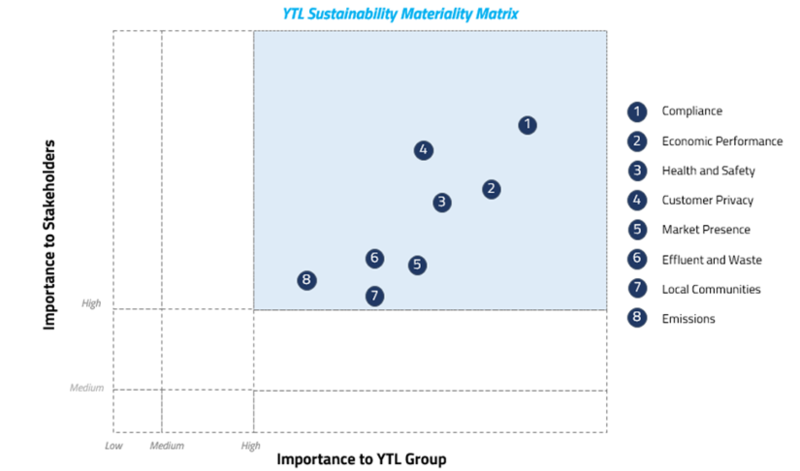 Since our humble beginnings in 1955, YTL sustainability sits at the heart of our approach to business. Social responsible and sustainable operations are a norm to us. Operating sustainably is an integral and vital component of our business strategy. Our ambition is to provide our customers and consumers with products and services that meet their expectations whilst minimising the impact of our operations on the environment and local communities around us. We strive to integrate sustainability initiatives into the Group's business model. 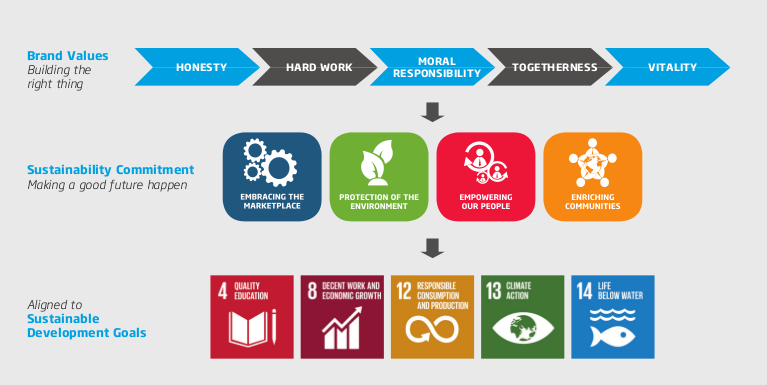 We are fully committed to being a responsible corporate citizen and we strive to bring positive change as a force for good by improving lives everywhere we operate, aiming for a healthy, safe and sustainable environment and considering the needs of the present generation whilst, a the same time, anticipating the needs of future generations. We continually raise awareness of sustainability issues amongst our staff, to build value for our stakeholders; and to manage our businesses and serving our customers as sustainably as possible. At YTL, we are committed to upholding the highest ethical practices and corporate governance standards in all our dealings. Governance and the creation of value to all stakeholders are mutually dependent and it is critical to business integrity and the creation of sustainable business. Responsible and transparent management of the businesses shows accountability and ensures the long-term success of the businesses. We believe there can be no comprise of these aspects when it comes to the way we govern our businesses, manage risk and analyse opportunities. Click here to learn more about our Corporate Governance. 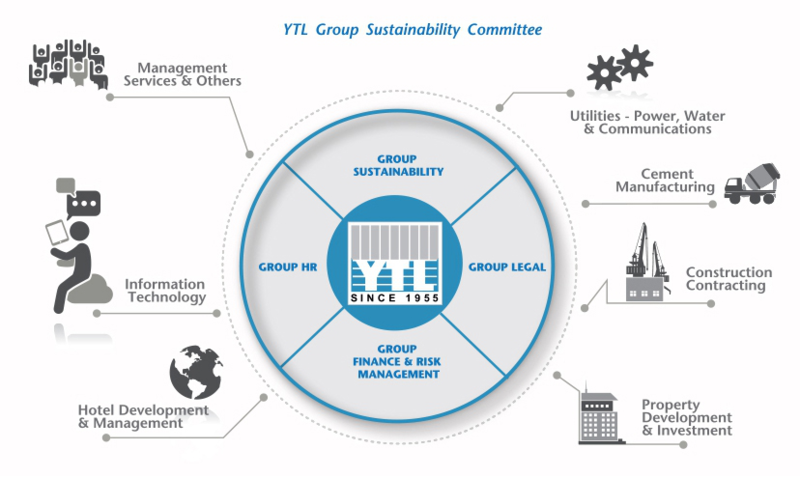 Recognising the importance of embedding sustainability in the way we work, the Group set up YTL Group Sustainability Committee (YTL GSC) in 2011. 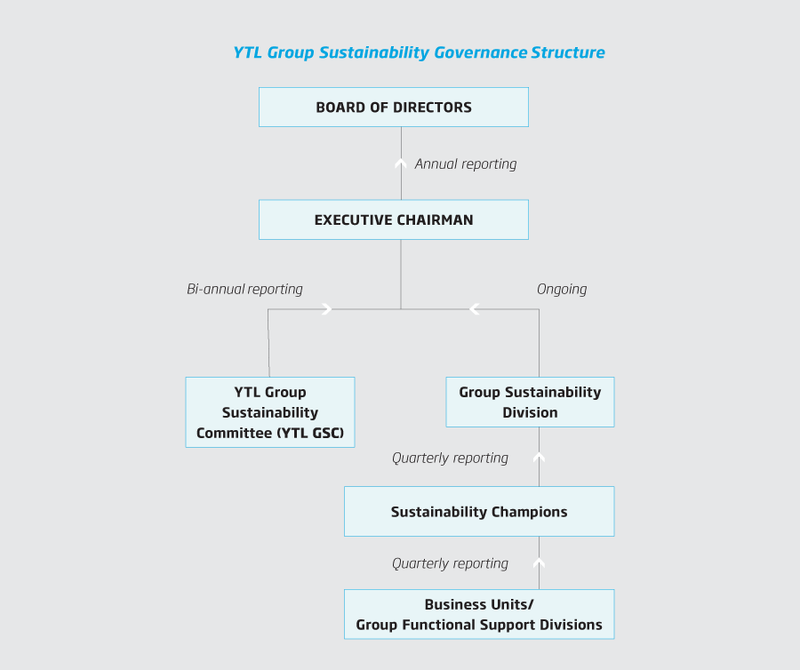 Led by YTL Corporation Berhad's Managing Director Tan Sri Dato' (Dr) Francis Yeoh, it comprises representatives from the Group's Sustainability Division and Senior Management from the entire Group's Business Units. The committee is responsible for overseeing and ensuring sustainability implementation and setting high-level direction and strategic focus. We constantly engage with our stakeholders through various channels, formally and informally. Driving meaningful dialogue with our stakeholders is crucial to our success as a company. Issues raised by stakeholders are prioritised and validated with relevant key personnel and functional representatives, including our Board. It continues to be YTL Group's process of engaging and maintaining dialogue with our stakeholders to address the most pertinent issues. 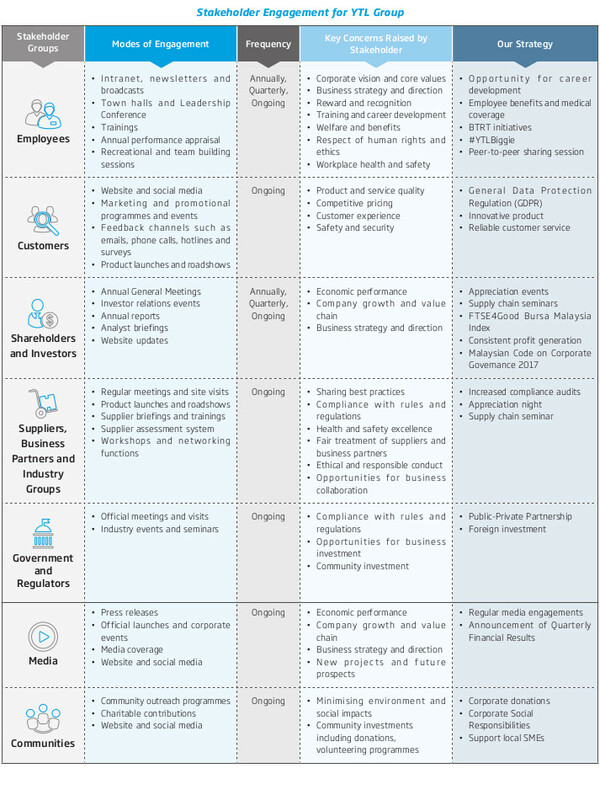 The following table encapsulates a list of key stakeholder groups, various methods of engagement, key issues which are raised, and how we respond.